Have you had a tyre puncture in Sandgate? Tyrepower Sandgate can help. Your first priority is to find a safe place to remove the punctured tyre and fit the spare, making sure that you're out of the way of any traffic. If you need too, give us a call on (02) 4088 8065 and we'll do our best to help over the phone. Your next priority is to get the punctured tyre repaired as soon as possible, especially if your tyre is a space saver or speed limited. You can tell if it's a space saver tyre, as they're generally smaller in size than your regular tyres. Call in to Tyrepower Sandgate at 29 Wallsend Road, Sandgate and we can give you some options for fixing the puncture if possible, or replacement. Most puncture repairs will be done as soon as possible, A mushroom plug is fitted which is a permanent seal and good for the life of the tyre. Do you need to repair or replace? Check out the below diagram for a guide. 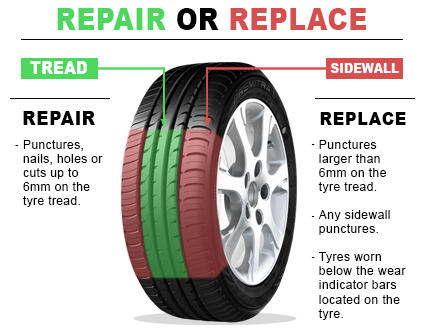 Before you get a puncture, you also want to make sure that your spare tyre is serviceable. It should be correctly inflated and have minimum 1.6mm of tread. If you would like us to check it for you, don't hesitate to drop by Tyrepower Sandgate for a free tyre check.